Wall Street looked poised to continue its record-setting run on Wednesday, with futures indicating that markets will start the day in positive territory. 1. Another record high in sight: U.S. stock futures were slightly higher ahead of the opening bell, suggesting that the S&P 500 may soon hit another record high. All the major U.S. indices have gained ground over the past four trading days, rising by roughly 2% to 3.5%. 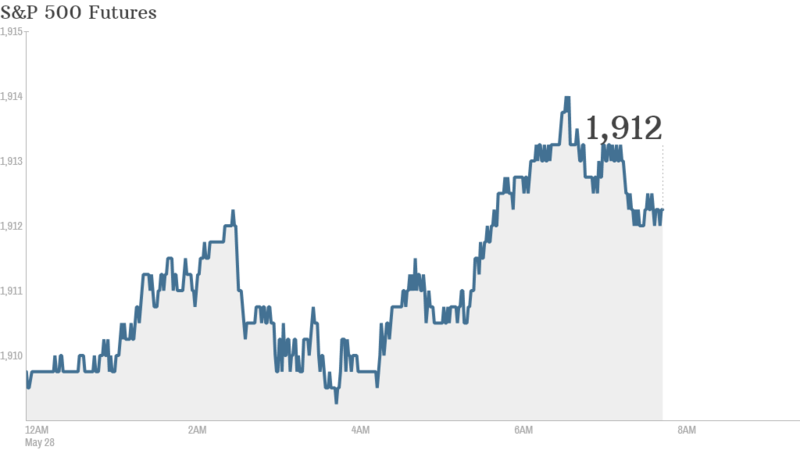 The S&P 500 ended at a record high Tuesday. "We continue to see a market that feeds on upward momentum," said Peter Cardillo, chief market economist at Rockwell Global Capital. But after a strong performance at the close of May, he projected that the market will hit a "short term top" in June and trade "sideways" until a new catalyst comes along. "The market needs to take a breather," he said. 2. Stocks on the move -- GlaxoSmithKline, Disney: GlaxoSmithKline (GSK) shares were down in premarket trading after the company revealed it was being investigated by the U.K.'s Serious Fraud Office. Tesla Motors' (TSLA)stock was flat before the open, even though Standard & Poor's downgraded the electric car maker's debt to junk status. 3. Earnings: Michael Kors (KORS) shares jumped before the open after the fashion house reported strong results. Shares have surged by 18% since the start of the year, as shoppers snap up purses, clothing and accessories. 4. International movement: European markets were slightly higher in midday trading, while Asian markets ended mostly higher. The Shanghai Composite led the way with a 0.8% jump.